Barbara Sander looks forward rather than back, focuses on the positive, eschews the negative and concerns herself not at all with issues beyond her control. As the national president of the Brandeis National Committee nears the end of her three-year term on July 1, her characteristic optimism and energy continue to both inspire the organization and steel her in her fight against a mysterious cancer. Sander has worked tirelessly to bring the 25,000 BNC members around the country closer to the university, establish a vibrant leadership-development program, and connect more than 40 chapters to the national board. Thanks to her efforts, BNC membership is growing, and philanthropic support of the university is rising. Sander, who lives in Sarasota, Florida, has traveled the country to spread her hopeful message to BNC chapters from New York to California. She has visited 24 chapters over the past three years. Sander has been a role model in both word and deed. She recently made a generous gift to the university in support of the BNC’s Scholarship Campaign. “I can’t very well ask people to make significant gifts if I don’t do it myself,” she explains. Plunging into her work as BNC national president has been therapeutic for Sander as she battles a rare form of blood cancer for which there is no cure. She is following the protocol for treating multiple myeloma but has not regained feeling between her knees and toes. Her sickness and treatment have not interrupted her daily workout schedule of Zumba and aerobics. Madalyn Friedberg, a longtime leader in the Central Westchester chapter, who has served as national vice president of fundraising for the past year, will become the Brandeis National Committee’s national president on July 1. 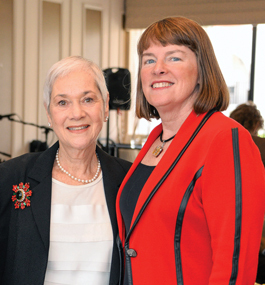 She succeeds Barbara Sander, who has served as national president since 2013. Friedberg, who joined the BNC in 1973, will lead the organization and its 41 chapters around the country for the next three years. In her role, she will serve on the Brandeis Board of Trustees. Vice presidents for 2016-17 will be Lynne Groban (Washington, D.C.), fundraising; Alexis Magid, P’15 (Greater Boston), leadership development; Norma Feinsod (Wycliffe), regional presidents; Lydia Axelrod (Trails of Delray Beach), learning opportunities; and Judith Levine (Phoenix), membership. Other new National Executive Committee members include Carol Abrams (Phoenix); Elaine Bloom (Trails of Delray Beach); Steven Hill (Gotham); Judith Kendall Levine (Gotham); Nancy Lightman (Greater Boston); Leslie Pearlstein, P’94 (Greater Boston); Carol Rabinovitz ’59, G’18 (Greater Boston); Lori Roth (Phoenix); and Carol Gliedman Weinberg (Gotham). Lucky for the Brandeis National Committee, retired lawyer Howard Bernstein takes a very close look at his credit-card statements. Two years ago, Bernstein won a $5 million settlement in a class-action lawsuit he initiated over a questionable $15 credit-card charge. Recently, he and his wife, Elinor, a leader in BNC’s Wellworth chapter, earmarked nearly $145,000 of the settlement’s proceeds for the Sustaining the Mind campaign. The Bernsteins have been active with the BNC since they moved to Lake Worth, Florida, in 1999, when Howard retired from Dworken & Bernstein, the Cleveland law firm he founded in 1959. Elinor has served as the Wellworth chapter treasurer. Howard frequently gives talks to BNC members about the couple’s travels to such exotic locales as Iguazu Falls, in Argentina; Iceland; Alaska; and the Galápagos Islands. Howard’s quixotic quest against the financial institution (although the settlement details are public, the Bernsteins have agreed not to publicize the bank’s name) began 10 years ago, shortly after he signed up for a special promotion that offered a 2 percent loan for six months. He took out a $25,000 loan and deposited the proceeds into a bank account that paid a higher interest rate. In a subsequent statement, Howard noticed the credit-card company had charged him $15 extra by applying his monthly payment to pay down the low-interest loan rather than his card balance, which had a higher rate. Although the bank had assured him the payment would be used to pay off the loan, the agreement’s fine print allowed it to designate the payment however it wanted. Bernstein, realizing that thousands of unsuspecting consumers had likely been victimized by the bank’s scheme, reached out to a former law partner at Dworken & Bernstein, Patrick Perotti, to discuss the feasibility of filing a class-action lawsuit. After a five-year court battle, in 2014 the bank agreed to a $5 million settlement, while denying any wrongdoing. Card holders who took out loans with the bank were entitled to $20 each. Funds that went unclaimed were distributed to charities. 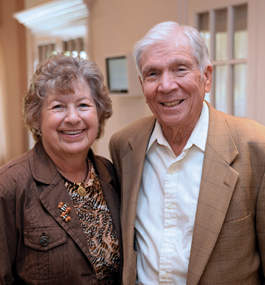 The Bernsteins chose the BNC as one of their charities, in addition to organizations in South Florida. Bernstein brought his lawsuit to ensure that people were compensated and the bank’s behavior was punished. Dworken & Bernstein pioneered the “cy pres” concept by which unclaimed funds from class-action settlements are distributed to charities rather than defendants. 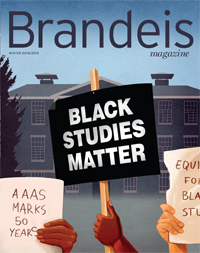 Now, thanks to Bernstein’s close examination of his bills, some settlement dollars are supporting Brandeis researchers as they take aim at neurodegenerative diseases. 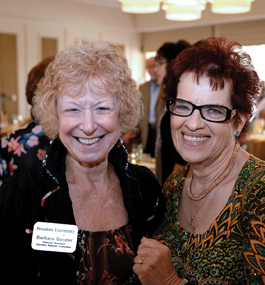 BNC chapter leaders from around the country visited Brandeis in May for their annual meetings. At the installation dinner, several leaders from New Jersey — Helen Ciangiulli, Judy Dorfman, Christine Retz, Marilyn Altman and Claire Heller — enjoyed the time together.